Some times you need to refresh web pages frequently for some reasons like following game score, expecting your exam results and more. Often if you refresh webpages manually may get tired. Use Auto Refresh Plus is simple extension available on Chrome webstore done this job easily. 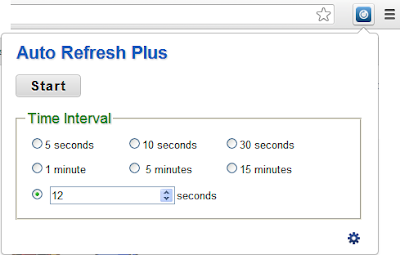 Auto refresh plus allows to set specific time interval to refresh as your wish. 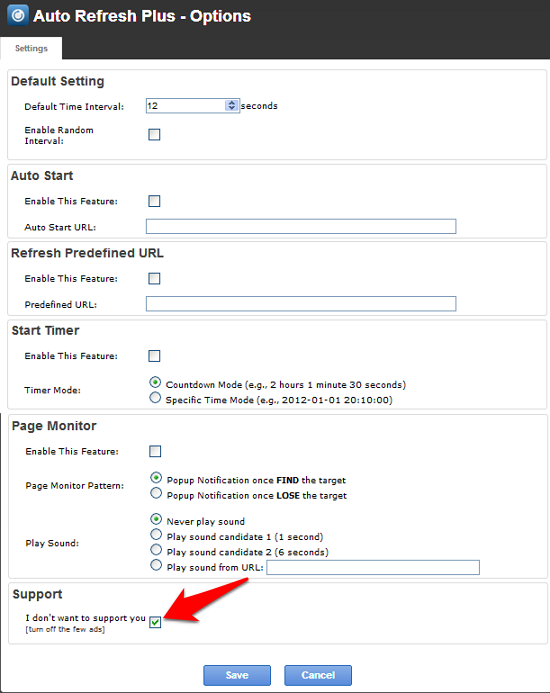 And also users can mention specif page URL to auto refresh. To install this extension click on this link Auto Refresh Plus to go to chrome webstore then click Add to Chrome button. After installed Auto Refresh Plus icon will show on your Chrome toolbar. Click on the icon then set your time interval and then click "Start" button. That's all the webpage will refresh automatically. If you want to see more settings click on the small gear icon to show the options page. Firefox users install Auto Refresh extension to your firefox browser to refresh webpages automatically. Auto Refresh will refresh or hard refresh any tab or group of tabs at individual or group intervals. You can also customize your presets and save the ones you most use.